A historic Arts & Crafts house set in a quiet valley. The views extend 20 miles towards the Marlborough Downs. The original Farm House (2 up, 2 down circa 1700) remained unaltered until 1900 when it was doubled in size and the gardens began. In 1926, the Architect Sidney Barnsley, with his assistant Norman Jewson, extended the house in the Arts & Crafts style for the Birchalls. 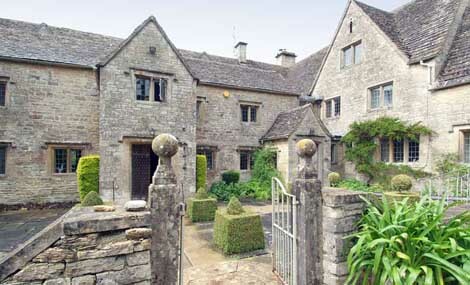 Sidney Barnsley also developed the exterior, with leaded windows and stone drip moulds over. The old farm buildings with pillars, a dovecote and summer houses echo the Barnsley style. In the 1930’s, Norman Jewson laid out the Terrace and the Gardens which fall away to the fields below and are enclosed by Cotswold Stone walls and yew hedges containing a fine collection of shrubs, roses, herbaceous plants and bulbs. The garden has all year round interest including carpets of handsome snowdrops naturalized in the woods, as well as a special snowdrop collection with many varieties. When Mark and Iona came to live at Cotswold Farm in 2000, their vision was to use the house for Christians in Leadership. If you are a Christian in Leadership and would like to consider using Cotswold Farm for yourself or for a group, please contact us. Garden Visits by Appointment welcome – see Contact Details. As a family home, the Garden is child friendly including a lilypond. Dogs on leads. Partial wheelchair access. Teas and House Visits can sometimes be added on for groups.